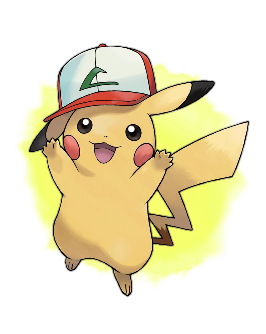 Ash's Pikachu (Original Cap) . 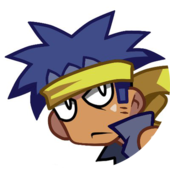 This event was distributed to players with a 3DS of US, EU or TW regions, via common serial code. 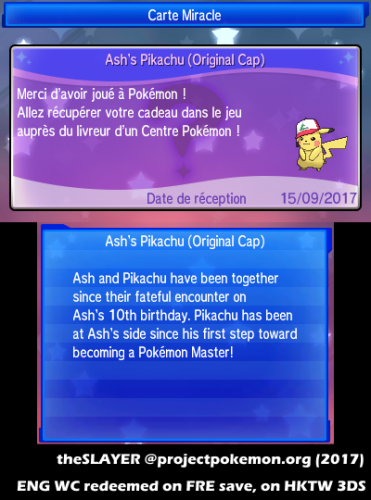 The code was accurately guessed to be PIKACHU20, hours before its reveal on official sites. The same code can be used to redeem other variations of this Pikachu, provided your save file hasn't received one via wonder card. The variations receivable follows a schedule. are the IVs random or fixed like the nature? @theSLAYER "provided your save file hasn't received one via wonder card"
Looks like there is another check on their servers. 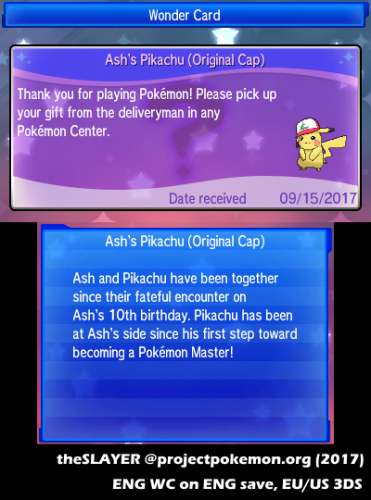 I made a back-up of my save file, received this Original Cap Ash's Pikachu by entering the code in Mystery Gift, backed-up that save as well, went back to my previous made save file without the wonder card and tried to receive it again, but it said I already received this gift. By doing this I was hoping to get all the variations and merge my save files in the end, but it looks like I need to make different save files for each of them. Is it risky to start a new save file for each variation and merging the Pokémon (not the wonder cards) in the end? Because my current save file is connected to a Global Link account and I don't know if they can see if I use the same cartridge with different new game saves each time to get all the variations and suddenly switch back to my save which is connected to my Global Link account. I can't trade my Hat-Pikachu to my friend!! Anyone know why??? @Scried yup that check has existed pretty much this entire generation. if I'm not mistaken, it appears that they note down our TID, SID, OT name and game sync ID. Somebody tell me because all pikachu hat haven't release yet!! For that reason we can't trade!! It has nothing to do with the remaining Pikachus being unreleased.